Jo-Jo Middlebury is dumped on New Year’s Eve by her fiancé just a few months before their wedding. She is done with love and with men in general. She is also trying to open her own gym but as life would have it, she has been let down by her contractors and the place is in disarray. Linus Travers has been single for one whole year after his divorce came through. He enjoyed being married and is determined that in the new year he will find ‘the one’ and settle down, again. He owns his own business and would you believe it, he’s an independent contractor. Mr. Blue Sky, well he isn’t exactly a he, just a name that it’s given itself. I say itself as it doesn’t have any gender. It is like a guardian angel, though it can’t touch or make you do anything. Also, it really has a thing for the seventies, hence the name – From the song by the Electric Light Orchestra. If you don’t know it, google it, it will have you feeling upbeat within seconds! At their friends New Year’s Eve party on the stroke of midnight, Jo-Jo sees Linus all alone and decides to give him a New Year kiss. She then walks away stating ‘She’s Done’. Linus however suddenly believes he’s found ‘the one’ and takes it upon himself to find the mystery woman who snogged him – Much to Jo-Jo’s displeasure and annoyance. However, she needs her gym opening asap and Linus offers to do the work quickly. 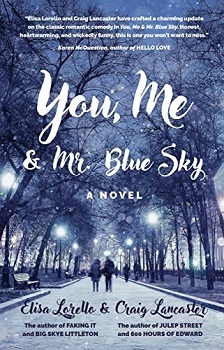 With them both wanting different things can Mr. Blue Sky have an influence over their lives? I must say that this was not only a highly amusing book but a very strange one too. It is told from multiple points of view – I know what you must be thinking, that I don’t like multi-POV books and you’d be right, however, this was slightly different as one of the voices wasn’t even a person and whilst they might be a kind of heavenly being – you will have to read the book to find out what they really are – they were so funny and the references to things I grew up with and a love for the 70s had me smiling and eager to read. Jo-Jo was a little annoying. She had trust issues – She even gets her police officer friend to find out information on Linus. Her attitude stank at times and wasn’t someone I would say was approachable. She was also a fab character and perfectly realistic. Linus was a bit of a wet lettuce and I can’t say I liked all the soppiness from him and the eagerness to find a woman. He did come across a little stalkerish, yet I also enjoyed spending my time in his company and found him very amusing. The book has been written by two authors and I did wonder if one wrote Jo-Jo’s part and the other took Linus’s part. However they wrote it, it has been done superbly and with a lot of humour and I enjoyed the book immensely and got through it in just two sittings. Craig Lancaster was born in 1970 in Lakewood, Washington. Adopted at birth, he lived initially in Wyoming before moving to Texas at the age of three with his mother and his new stepfather. He attended public schools in North Richland Hills, Texas, graduating from Richland High School, where he’s now a member of the Hall of Fame. After a circuitous and ultimately futile attempt at college, Craig embarked on a career as a newspaper journalist. He worked—mostly as an editor—in such places as Texas, Alaska (twice), Kentucky, Ohio, California (twice), Washington, and Montana. He wrote stories, edited copy, oversaw departments, spent a season covering the Oakland Raiders and, in general, had a whale of a time for nearly 25 years. In 2013, he left daily journalism to write full-time. Nowadays, in addition to his own literary work, he helps others reach their writing and publishing dreams through Lancarello Enterprises, serves as the design director and a frequent contributor to Montana Quarterly, and also works in the field of pipeline safety. Elisa Lorello wasn’t always a novelist, but has been a writer and teacher throughout her life. She grew up on Long Island, the youngest of seven children as a bona fide member of Generation X. After working as a retail store manager and a manicurist in her early 20s, she earned my bachelor’s and master’s degrees (psychology and professional writing) at the University of Massachusetts Dartmouth and taught rhetoric and writing at the college level for more than ten years. In 2012 she became a full-time novelist. To date, she has written and published ten novels, a memoir about her lifelong love for the band Duran Duran, and The Writer’s Habit, which inspired a blog and website, and workshops in storytelling, writing process, and rhetoric. This sounds like a fun romance. Brilliant review. It is a lovely fun book. “Linus was a bit of a wet lettuce” – if that’s not the best line I’ve read all year I don’t know what is. This sounds highly appealing to me, I wants it! I’ve always found the idea of two authors writing the POVs of two different characters intriguing. Great review. Wonderful review! I wonder if I have any friends that would be interested in this. This doesn’t sound like the book for me, but it does sound adorable. It is really quite good. But I can see how it wouldn’t be for everyone. Everyone seems to be laughing at that line. Great post. This is wonderful. Great review Stacey, this book looks and sounds so much fun and amazing I am really glad you fully enjoyed reading it. Thank you so much for sharing your awesome post.